Rose Season is well under way in Tyler, Texas. During the entire month of October, Tyler offers activities and workshops, all leading up to the renowned Texas Rose Festival, October 19-22. Rose Season is celebrated throughout the month with a variety of events for the whole family to enjoy. Some of those events include arts and craft fairs, historic home and rose tours, festivals, concerts, and more. 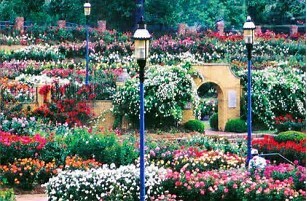 For a list of Rose Season activities go to www.VisitTyler.com/roseseason. Tyler had real cause to celebrate, so the Texas Rose Festival was born, known in the beginning as the Tyler Rose Festival. The annual festivities were quickly adopted and word of the elaborate gowns and awe-inspiring roses spread statewide. As the years progressed, The Texas Rose Festival played host to multiple dignitaries and gained significant national attention. Today, tourists come from all over to be a part of Texas history and participate in this annual celebration. Even though gardens filled with beautiful roses of every variety draw visitors to Tyler in October, the flower displays are popular throughout the year. Rose Season would not be complete without the Texas Rose Festival. This year the Texas Rose Festival will be celebrating with elaborate displays of roses and activities including the Rose Show, the Coronation, Queen’s Tea, and of course, the popular Texas Rose Festival Parade. In 2016, approximately 46,000 visitors from out of town attended the Rose Season festivities, which resulted in a $2.5 million estimated economic impact on the local community. That’s even more reason for Tyler citizens to be proud of their rose gardens and surrounding landscaping. 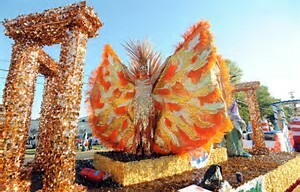 For more information about the Texas Rose Festival, visit www.texasrosefestival.com.